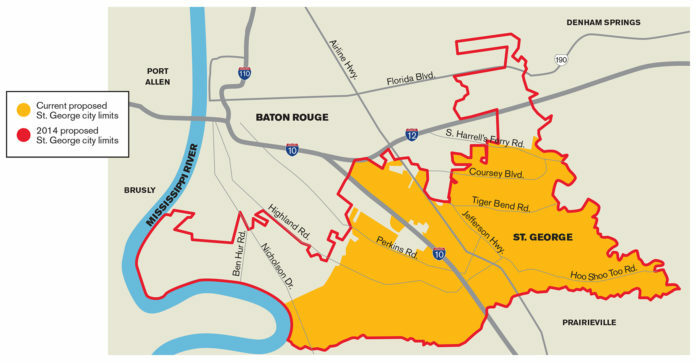 Nearly three months after St. George organizers submitted their petition to the East Baton Rouge Parish Registrar of Voters, Steve Raborn says his office is now beginning to count the signatures. Raborn previously told Daily Report the complicated verification process could take a couple months to complete, but the actual amount of time it will take to tally and validate the signatures is unknown, according to the Attorney General’s Communications Office, which is handling all media-related requests regarding the petition. “As of now, there is no timetable, but every effort is being made to complete it as quickly as possible,” the Attorney General’s office says in an emailed statement. Altogether, 13,000 signatures are needed to bring the incorporation effort to a vote, meaning 25% of registered voters within the proposed city’s boundaries have to endorse the idea. Organizers previously claimed 14,500 people signed the petition. As the validation process begins, St. George organizers say they’re ready to move forward and determine if the item has a place on the next ballot. “We’re happy that they have begun counting, and we hope that they’re able to get it done as efficiently and quickly as possible,” says Lionel Rainey, who is part of the St. George leadership team that filed the petition back in October. The 2015 St. George attempt took the registrar’s office months to review, but this time around could take longer, due to new laws and advice Raborn previously said he received from the Attorney General’s Office. The count was also delayed by elections held in November and December. Read a recent Business Report cover package on the St. George incorporation effort.